If you are in Paris this year and you are interested in Great War you will not run the risk to get bored. A cluster of activities and meetings are planned during this year to mark the begin of the WWI one hundred years ago (an overview here). Today we’d like to point out a couple of exhibitions. The first one takes place at the Galerie des Bibliothèques de la Ville de Paris and displays the photo collection of Charles Lansiaux (1855-1939), who covered with his camera the French capital during the years 1914-1918. Its shots witness therefore meticulously the impact of the Great War on the population, ranging from the general mobilization at the beginning of the conflict to the refugees, from the collective engagement in supporting the military effort by attending the wounded or raising money to the first bombings. Furthermore the tragedy of orphanage, mutilation and civil privation are depicted. There are also interesting images of the city, both desolated or crowded by human masses. 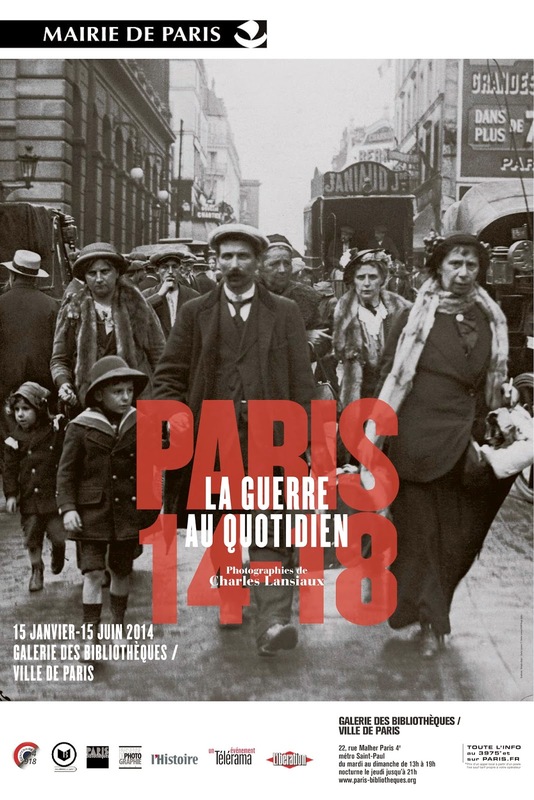 This exhibition – entitled Paris 14-18: la guerre au quotidian, till 15th June 2014, further information here – is for sure interesting, yet very small and the entrance ticket is maybe a little bit too expensive for the whole. That’s why we suggest to combine another exhibition, which is equally fascinating but with free admission. You just have to move to the Jardin de Luxembourg. We suggest to run immediately to the Orangerie du Sénat, where the exhibition Jours de Guerre 1914-1918 (detailed information here) takes place. The sources of this initiative are provided by the Excelsior, one of the first French daily newspapers illustrated with photos. Founded in 1910, its photographical materials had been published never again. Only a small part (120 pictures) of the 5.000 photos (selected among the 20.000 shots covering the time span 1914-1919) are on display, but they offers a incredible testimony to both the military and civilian life, both French and other nationalities’ people, both animal and human beings, moving between the front (namely the western one) and the rearguard. The meaning of global war is so transmitted very well and some pictures are really touching and outstanding. To conclude, we suggest to walk across the Luxembourg gardens – also in front of the Senate there’s a nice installation, have a look at – and exit at Place Edmond Rostand, in front of the Pantheon. Along the grating of the garden another exhibition is waiting for you. Contemporary images from the old battlefields are printed on big panels and combined with short capitations in French, English and German. These photos are part of the biggest projects Fields of Battle – Lands of Piece 14-18, a street gallery exhibition which is now to tour internationally, and found a dock also here in Paris. Another example how to build bridges between past and present and among all countries and culture in occasion of the centenary and – we really wish – even beyond.